Uniquely Framed Memorabilia to compliment any room. A uniquely designed disc with printed signature/signatures. Mounted using “White core” Black Conservation mount card. 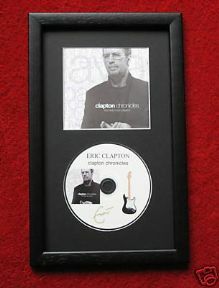 This CD Disc Memorabilia Presentation is a product completely designed and manufactured by musicdezigns.co.uk having been established and working for over 20 years producing Gold, Silver and Platinum Disc Presentation Awards, supplying the Music Industry, Trade and Fans with unique designs and high quality framed memorabilia.